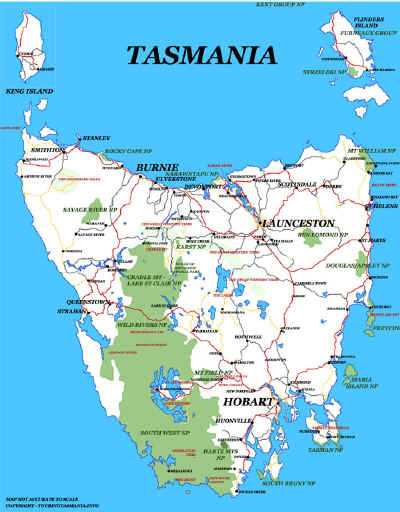 There are many cliff top walks on the Tasman Peninsula in and around Port Arthur. Cape Raoul is one of the most spectacular ones in Australia. Nine kilometres past Port Arthur there is a turn left along Stormlea Road. 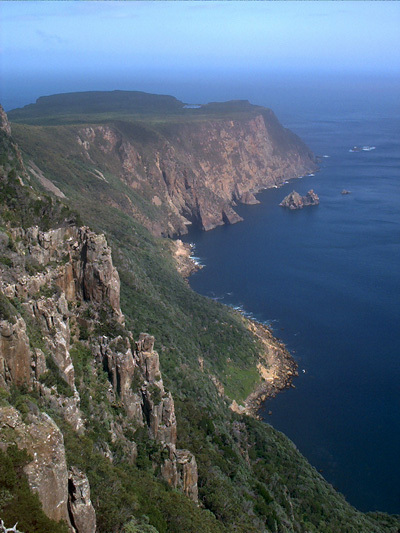 Another 9 kilometres further on is a parking area for the Cape Raoul, Shipstern Bluff and Tunnel Bay walks. The road continues on for a few hundred metres to a small stile which crosses the fence. About 30 minutes walk across the side of a paddock and through light woodlands the track to Tunnel Bay and Shipstern Bluff branches off to the right. Another 10 minutes further on brings you to the edge of a 300 metre high cliff with commanding views of the coastline. The track then descends steadily onto the Cape Raoul plateau. The spectacular dolomite pillar cape is at the end of the plateau. The walk is about 2 1/2 hours one way. Looking south east towards the Cape Raoul Peninsula. This point is reached after only about 40 minutes from the parking area. The cape is to the left of the lake at the end of the peninsula. Note, the water is not suitable for drinking. Take plenty of water even on a cool day. The view the opposite way is just as spectacular.